DCSD receives Golden Radish Award for Farm to School accomplishments. 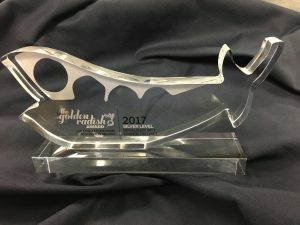 DCSD was recently honored with a Golden Radish Award by Georgia’s Departments of Agriculture, Education and Public Health, as well as the University of Georgia Cooperative Extension and Georgia Organics for its outstanding farm to school program. Offering 355 taste tests of locally grown produce utilizing recipes that featured school garden grown items like kale pesto, radish bruschetta, and carrot and kale stir-fry. Integrating farm to school into the curriculum through science, technology, engineering, math, and health. Parents and volunteers hosted school farmer’s markets to raise money for the school garden by selling garden grown produce. 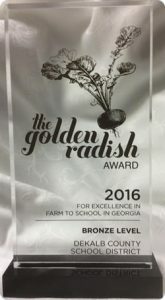 On Monday October 24, 2016, DeKalb County School Nutrition Services received the Golden Radish Award for Farm to School Accomplishments. 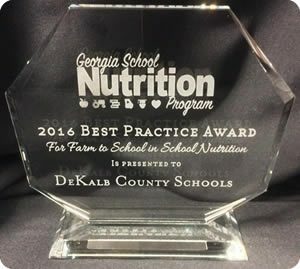 DeKalb County School Nutrition Services earned two Best Practices Awards on October 6, 2016: Promoting a Healthy School Environment and Customer Service – Working Smarter Not Harder for outstanding practices in the State of Georgia. The Farm to School Initiative, Fundraiser Strategies were added to the revised Wellness Policy/Regulation. School Nutrition Services was recognized for implementing a district wide Wellness Policy Assessment Evaluation Checklist. This tool is used to evaluate school-based wellness activities for annual compliance. The District’s Summer Feeding Program was recognized for serving high quality meals to ensure all children have access to meals during the summer months. DeKalb County School Nutrition Services operates two programs simultaneously during the summer providing meals to the students of the District. To work smarter, not harder and to provide great customer service, School Nutrition Services utilized three central meal preparation hub sites that provided meals to 55 DeKalb Parks and Recreation Programs. Onsite meal preparation was conducted at 77 schools. 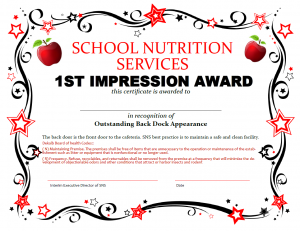 The program employed top performing School Nutrition personnel. School Nutrition coordinates program goals with the District, DeKalb County Parks and Recreation Program, DeKalb County Board of Health and Community Outreach Programs. 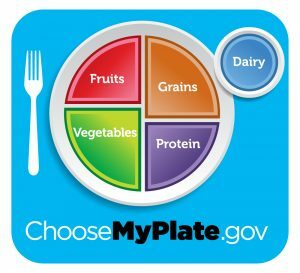 The Healthy Hunger-Free Kids Act provides an additional 6-cents per lunch reimbursement to school districts certified to be in compliance with the new meal patterns. 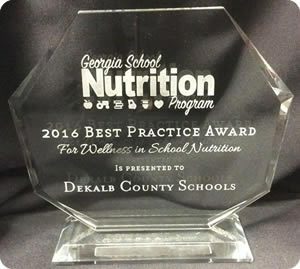 DeKalb County Schools, School Nutrition Services has achieved and maintained this certification since School Year 2013-2014. This certification helps with improving the nutrition content for children and program financial integrity. The back door is the front door to the cafeteria. School Nutrition Services best practice is to maintain a safe and clean facility. (N) Maintaining Premise. The premises shall be free of items that are unnecessary to the operation or maintenance of the establishment such as litter or equipment that is nonfunctional or no longer used. (R) Frequency. Refuse, recyclables, and returnable shall be removed from the premise at a frequency that will minimize the development of objectionable odors and other conditions that attract or harbor insects and rodents.